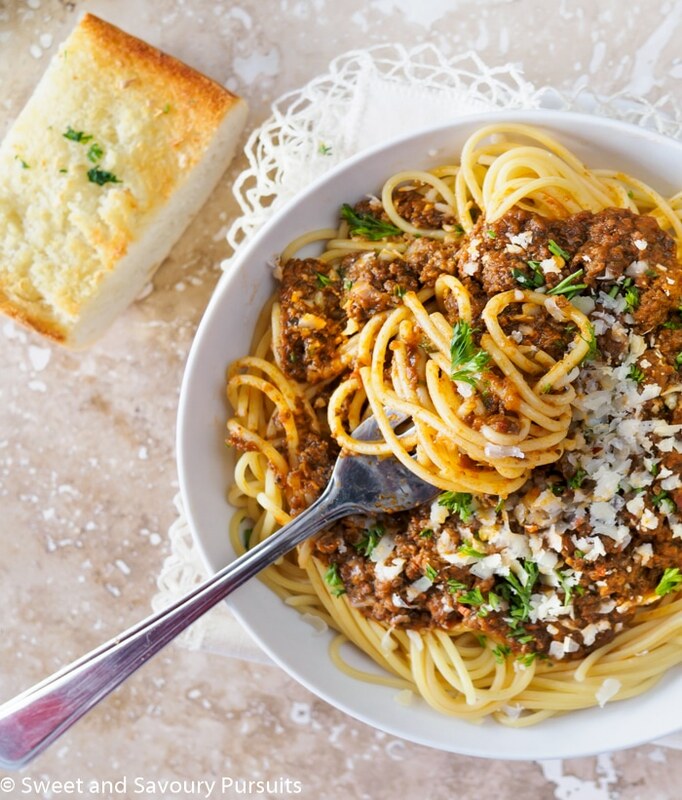 Two ingredients in the spice blend of this delicious, Easy Spaghetti Meat Sauce recipe make it stand out from the rest and will have your guests asking for more. This Easy Spaghetti Meat Sauce is loaded with fresh vegetables, ground beef, tomato sauce and spices. But so are almost all of the meat sauce recipes out there, so you might be wondering what’s so special about this recipe? Well I believe it’s a couple of the spices that I include when seasoning the sauce. When adding the spices to my meat sauce, I include the usual oregano, basil and bay leaves, but I also include ground cumin and coriander (the dried seed of cilantro). These spices make the sauce super flavourful and really make it stand out from the rest. Can you make a spaghetti meat sauce from jar sauce? Another ingredient that I add to this sauce is a ready-made organic tomato and basil pasta sauce instead of a plain tomato sauce or canned crushed tomatoes. I don’t know why it feels like I’m committing some kind of culinary infraction when I do this? But when I think about it, there isn’t much difference between using a really good quality jarred tomato pasta sauce and using a can of plain tomato sauce which I will need to add more seasoning to anyways. I like to think of it as a practical short cut, like using ready-made broth instead of always making my own from scratch. However, when choosing your sauce make sure to check the amount of sodium, it can vary greatly from one brand to another. But what’s great about this recipe is that it’s completely up to you to use what you prefer, you will just have to add more seasoning if you use a plain tomato sauce. What I love about sauces like this one, is that after you’ve made the sauce once, you can adjust it to your liking by playing around with the spices, adding more or less, or omitting one all together. This recipe makes quite a bit of sauce, I like to make a large batch that I can then portion and freeze, it makes life easier on busy weeknights. But if you prefer a smaller batch you can easily cut this recipe in half. I rely on this easy meat sauce often when making pasta, I especially like to use it on spaghetti and in my lasagna. Enjoy! 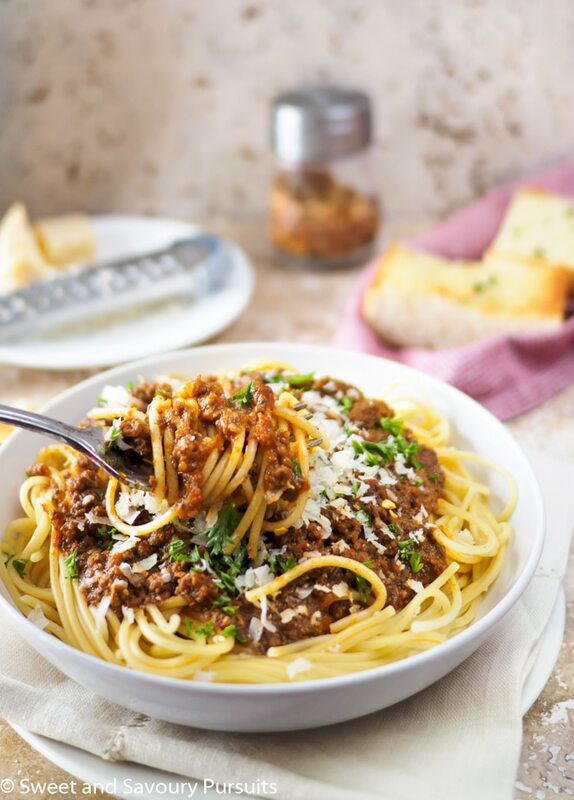 Two ingredients in the spice blend of this delicious, ground beef Easy Spaghetti Meat Sauce recipe makes it stand out from the rest and will have your guests asking for more. Wash vegetables and peel garlic, onions and carrots. Cut all vegetables into chunks that will fit into your food processor. Start by adding the onion and garlic to the food processor, when vegetables are chopped to your liking, add them to the saucepan and give them a quick stir. Continue to process the rest of the vegetables and add them to the pan as you go. Stir and cook until softened, about 10 minutes. Raise the heat to medium high and add the ground beef, sauté and break up the large chunks of meat. Cook until the ground beef is no longer pink, about 10 min. Add the tomato sauce and all the seasonings, reduce heat, stir and let simmer. After the sauce has simmered for approximately 30 min, taste and adjust the seasonings. Reduce heat to low, and let simmer for two to three hours, stirring occasionally and adding tomato juice, beef broth or water if too much liquid has evaporated. When ready to serve, taste sauce one more time and adjust seasonings, remove bay leaves. Serve over pasta of your choice, sprinkle with chopped fresh parsley (or basil) and freshly grated Parmesan cheese (optional). *Depending on what tomato sauce you use, whether it's a ready made store bought pasta sauce, crushed tomatoes, or plain tomato sauce you will have to adjust the seasonings to your liking, adding a little at a time and tasting often is the trick to a great tasting sauce! If you prefer, you could use plain tomato sauce or crushed tomatoes with purée*, make sure to season sauce with oregano, basil, salt and pepper. This looks so good! Can’t wait to try this recipe. Thanks Andrea, it’s my favourite pasta sauce, I hope you enjoy it! I can’t wait to try your meat sauce recipe as your spices are some of my favorites…very creative. Thanks so much Karen, I hope you enjoy it! No culinary infractions committed here, Fida. Now if you simply opened the jar of sauce, at left it at that, it wouldn’t be much of a recipe then. 😉 However, you’ve taken a humble, basic sauce and turned it into something fabulous! If it’s even half delicious as it looks…you’ve created a masterpiece! This is so easy to make which is great for a mid week dinner and it looks incredibly delicious! Thanks for sharing. That’s one of the things I love so much about this sauce, thanks so much for stopping by and leaving a comment! Fida, I love the idea of adding cumin, coriander and even cinnamon to meatballs and meat sauces. It makes the flavours more complex. So I will definitely give this recipe a try. Thanks! I adore your photos!!! You honestly had me believing for a second that I could grab that fork loaded with pasta!!! 🙂 Love the addition of cumin and coriander too, I get what you mean. My secret ingredient is soy sauce!! Thanks so much Nagi! Soy sauce, really? Now I’m curious, I’ll have to try it next time I make my sauce! Tried this the other day, great meat sauce and so easy to make. Hi Alex, so happy to hear you gave this a try already and liked it! Spaghetti with meat sauce is a childhood favorite. In fact, when I visit my parents I put in a special request 🙂 This looks like such an amazing and incredible bowl of comfort! I know it’s such a good comfort food, definitely one of my favourites and now my kids love it too. Thanks Amanda, I love mushrooms in my spaghetti sauce. Thanks for stopping by! 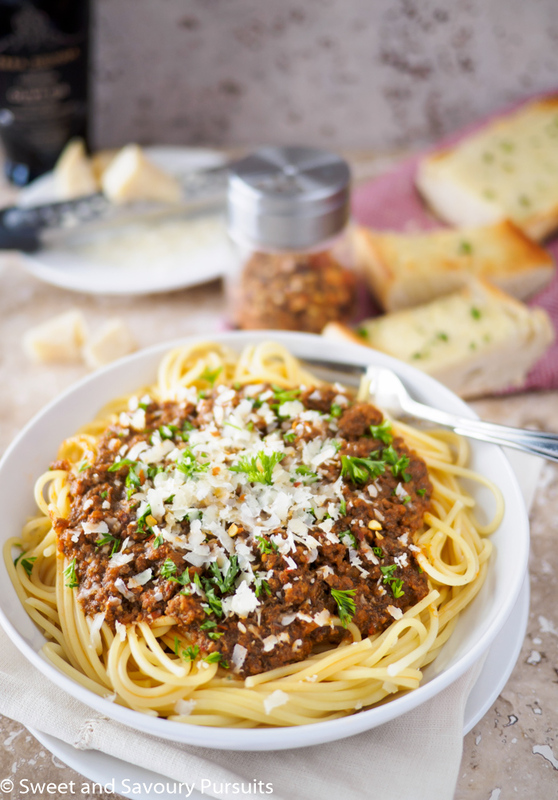 This meat sauce sounds so good–I love all the spices you used in this! Thanks Nancy, the spices really make the sauce! Looks great, will definitely give this recipe a try! Thanks so much Lynz, have a great weekend!